In December 2016, myself and three colleagues of the Edinburgh Law School had the pleasure of being invited to participate in the conference entitled “Intellectual Property and Information Technology outside its borders” organised by the CUERPI Research Centre at the Grenoble Law School. The programme of this multi-lingual conference (mostly in French and English, with many hints of Italian) was very rich. It covered many topics not only in IP law but also in privacy, data protection or the protection of minors. The format of the presentations was very original and conducive to comparative law analysis. On each topic there would be two speakers, one from France and one from another EU country, each speaking in their language of choice, and elaborating on the position in their respective countries. Jane Cornwell discussed ‘European harmonisation of enforcement of IP rights’ with Thomas Bouvet, Partner at Veron Office (Paris-Lyon). Smita Kheria discussed ‘Moral rights in France and the UK’ with Guillaume Deglaire, partner at DDG Office (Paris). As for me, I had the honor to chair the afternoon session. The discussions were very stimulating and fruitful, demonstrating the benefits of comparative law and the advances of and obstacles to European Harmonization. Unsurprisingly, Brexit loomed large on the horizon. And, although many such discussions had already taken place on the topic in the UK, it was the first time I saw the topic tackled from the continental perspective. The conference was excellent. It was hosted in the superb Musée de Grenoble where we were all treated to a visit of the Kandinsky exhibition. 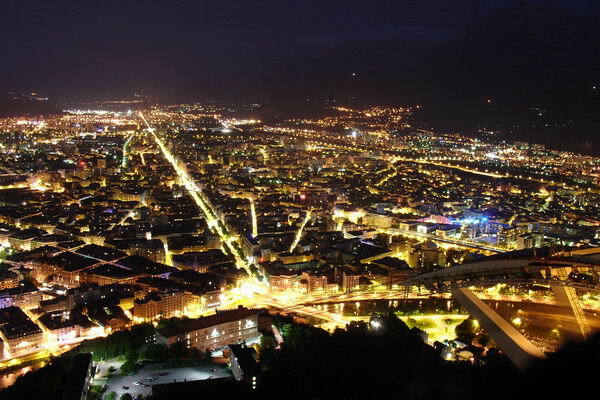 We also enjoyed fantastic entertainment and dinning before, during and after the conference, notably at the dinner/graduation ceremony at Restaurant le Téléférique, at the top of Fort Bastille with an amazing view of Grenoble [See picture. Credits: Grenoble de Nuit by Milky (2007) CC-BY-SA-3.0]. Thanks again to the organisers of the conference, especially Amélie, for having invited us. Grenoble : plus que dix jours pour voir l’expo ‘Kandinsky’ au Musée, Le Dauphiné, 20 January 2017 <http://www.ledauphine.com/isere-sud/2017/01/19/l-exposition-du-musee-de-grenoble-consacree-a-la-periode-parisienne-(1933-1944)-de-vassily>.